PANAMA CITY — Esther Marina Sanchez has watched her neighborhood — the heart of Panama City — transformed by its designation as a UNESCO world heritage site. Tourists and well-heeled Panamanians now stroll the paving-stone streets among gaudy hotels, fancy restaurants and trendy discos that have popped up in once-dilapidated colonial-era buildings. Gone are the gangs, the decay and abandoned structures — as well as Sanchez’s home, and those of most of her neighbors. A fast-moving real estate boom spurred by the 1997 declaration of the Casco Antiguo district as a world heritage site has irrevocably altered the character of the neighborhood. Locals initially welcomed the designation, hoping to reap the benefits of the revitalization that would come. But it ended up pricing them out, as long-absent landowners suddenly saw money to be made by converting properties to hotels or night spots or renting them to well-heeled tenants. According to census figures, the population of the Casco and neighboring San Felipe districts has dropped from about 16,000 in the early 1990s to a little over 2,000 today. The seaside Casco and its defensive walls were founded in 1673 to replace the first Spanish settlement on the Pacific Coast after it was sacked by pirates. It housed — and houses — some of the country’s central institutions: the official presidential residence, the Metropolitan Cathedral and the National Theater. Over the years it fell into disrepair as newer neighborhoods elsewhere in the city became more attractive. Wealthy residents moved out, and low-income families and gangs moved in, in many cases squatting in abandoned architectural treasures. The UNESCO declaration suddenly reversed that trend. They have been replaced by flip-flop-clad tourists snapping pictures of historic churches and dining in sidewalk cafes near a scattering of jacaranda flowers. At night, music echoes through the streets. “It is more developed. You can tell that they have brought substantial labor to the restoration,” said Roberto Perez, a tourist from Madrid. The last time he visited, in 2008, a group of youths mobbed him and made off with his camera. This time he enjoyed the Casco so much he extended his stay. “There was a good vibe, good music, good atmosphere,” Perez said. 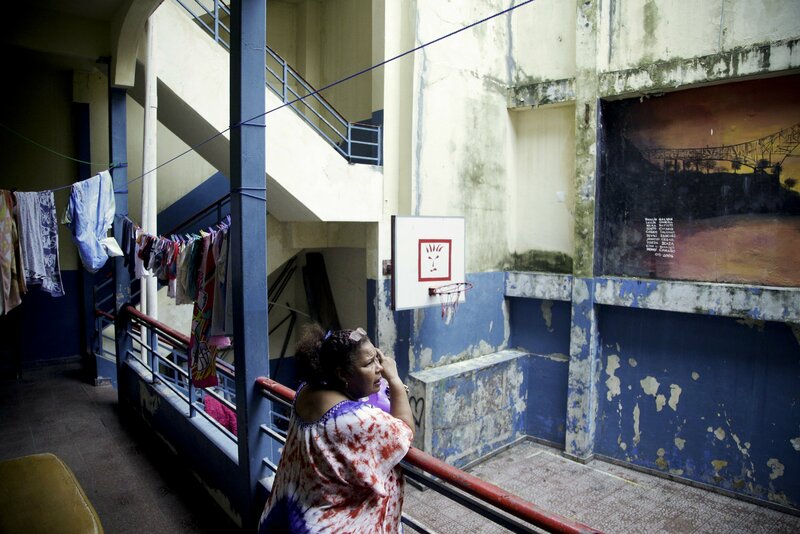 Sanchez and her relatives, along with 27 other families, ended up in an abandoned three-story school with no electricity, among the last holdouts of longtime residents. Sleeping in converted classrooms, they share bathrooms and hang laundry out on interior balconies just down the street from a luxury hotel that used to be home to local gang leaders. Many locals who have been forced out over the years ended up in homes far away on the city’s outskirts, but Sanchez and others swear they will not accept relocation outside the neighborhood they call home. Authorities say displacement of families who decades ago took over the deteriorating buildings would have happened sooner or later, once landowners saw value in retaking those properties. Ariana Lyma Young, director of the governmental Historic Heritage agency that approves restoration projects in the Casco, acknowledged that the boom has affected poor residents, but said the economic benefits have been tremendous. The Casco is now the country’s No. 2 tourism draw after the nearby Panama Canal. Rene Quiros, a Bolivian who moved to Panama 35 years ago, said that when he arrived, the Casco was “very dangerous, very uncomfortable.” He has had a front-row seat for the transformation, and has also reaped the rewards through the tapas restaurant he runs in a restored building off the main square.